Recently, I was reunited with one of my best friends, Devon Fox, while MLB held its All Star festivities in New York. It was like the good ol' San Francisco days, enjoying food, music, baseball and laughs until the wee hours of the morning. After the work portion of her trip was complete, she hopped on a train to come see what Connecticut was all about. Since cooking together was always such a big part of our lives back in SF, we decided we would make dinner at home. (Following a boozy lunch and spa day of course). After scooping her up at the train station, we decided to swing by one of the local farmer's markets that was billed as "one of the biggest in Hartford." We giggled a little when we walked up. The Ferry building it was not, but it still had a couple of good finds, including some mint mojito Italian ice from Chet's. On a 100-degree day, this was a life saver. We bought individual cups to cool us off as we perused the produce and went back for a pint later on. We also picked up some local peaches, as Devon had suggested grilling them and serving them with vanilla ice cream. Fast forward to our post-massage-induced coma and an 80-dollar shopping trip at Whole Foods in which we hit up the antipasto AND trail mix bars, picked up some fancy cheese, steak for the grill, and about a million other things that sounded good at the time. Well, we somehow forgot to buy ice cream, and we also forgot to grill the peaches. So.... long story short. I had some peaches leftover. I decided I still wanted to grill them, but decided instead of serving them WITH ice cream that I would serve it IN ice cream. A genius revelation if I do say so myself. I also had some leftover basil from our caprese salad we made (with tomatoes from the little farmers market!) so I decided to infuse the cream with it like I did with the Strawberry Rosemary Ice Cream last summer. If you're thinking to yourself "that sounds gross," hear me out. The basil is very subtle... like, if you didn't know it was in there you would think it was just an interesting and delicious dimension to the ice cream. But if you're totally against it, I give you permission to use mint instead or omit it altogether. Normally if you were just grilling the peaches to serve with ice cream (or with pork or in a salad....mmmm), I don't think the peeling is necessary. But since these were going in ice cream, I felt the extra step was a good idea. To easily peel peaches, score with an "x" and blanch in boiling water for 30 seconds, then plunge into a bowl of ice water. Once peaches have cooled, rub off the skins with your fingers. Cut in half, and remove pits. Admittedly, my peaches were a little more ripe than I would've wanted so they didn't come apart in neat little halves... more like chunks. But they were just going to get mashed up anyways so who cares. Heat grill to medium and grill peaches for a couple minutes per side. I love the slightly smoky flavor the grilling added to this ice cream. I even loved the little black "flecks" from the grill marks that subtly dotted the finished product. Chop or puree depending on the consistency of ice cream you desire (or do a combo of both). I actually went potato masher in this case but do whatever your little heart desires. Place peaches and any accumulated juices in a container and stir in vodka or kirsch (this will help battle any "icy" effects from the fruit). Also sprinkle with a tablespoon of sugar. Place in refrigerator. 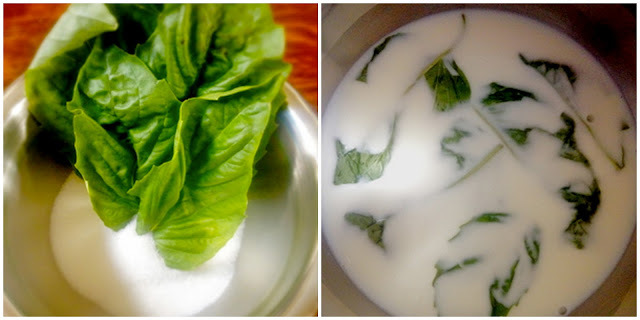 Combine 1 cup of the cream, milk, sugar, salt and basil in a small sauce pan. Heat until very warm, but not boiling. Remove from heat, cover and allow to sit for 15-20 minutes. Discard basil. Return pan to stove and heat again. (Full disclosure: I lifted these particular photos from a previous post since I was actually making this at midnight on a Saturday and couldn't take photos). You get the idea though. While basil is steeping, prepare an ice bath. Fill a large bowl with water and ice. Place a smaller bowl inside and pour in other cup of cream. To make the custard, whisk egg yolks in a separate bowl and add about a 1/2 cup of the warm cream mixture into the eggs while continually whisking. This will help "temper" them so they don't scramble. Return egg mixture to the pan and cook, stirring constantly, until mixture is thick enough to coat the back of a spoon. Strain custard into chilled bowl with the cream and add vanilla extract. Stir until mixture has cooled down considerably. Refrigerate for at least four hours or overnight. Freeze in an ice cream maker according to manufacturer's directions. Towards the end of the process (when ice cream is 2-5 mintues from being finished), add in the peaches and continue freezing. Enjoy immediately if you prefer a "soft serve" consistency, or freeze for an additional couple hours for more traditional ice cream consistency. (By the way... photographing ice cream might be one of the hardest things... especially when it's 80 degrees outside the window you're working with. On the plus side, the photo shoot was done in about five minutes flat). Heat a pot of water until boiling. Score each peach with an "x" and blanch in boiling water for 30 seconds, then plunge into a bowl of ice water. Once peaches have cooled, rub off the skins. Cut in half, and remove pits. Heat grill to medium and grill peaches for a couple minutes per side. Chop or puree depending on the consistency of ice cream you desire (or do a combo of both). 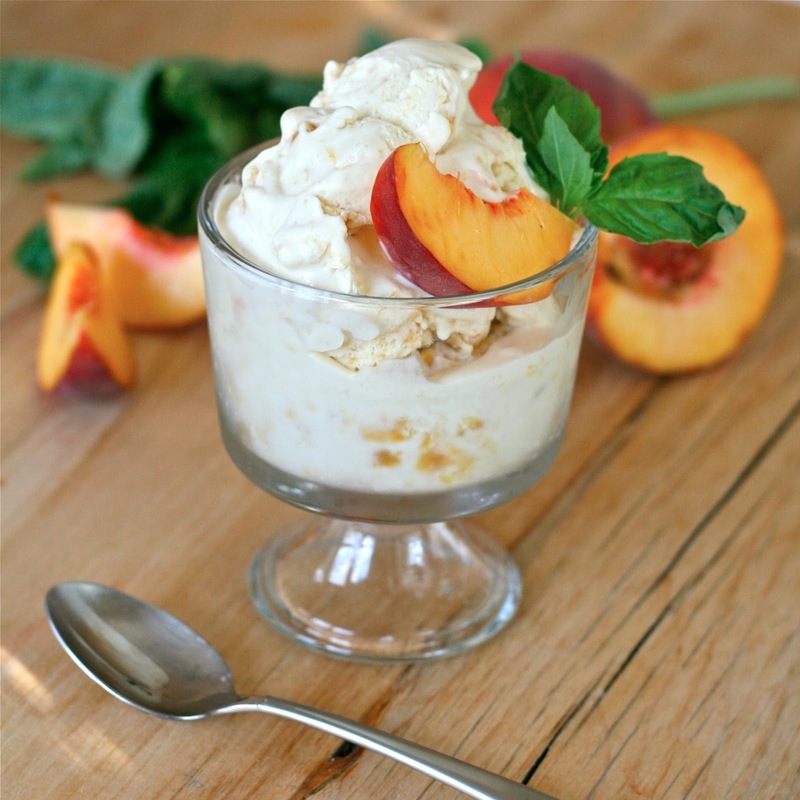 Place peaches and any accumulated juices in a container and stir in vodka or kirsch and 1 tablespoon sugar. Place in refrigerator. Combine 1 cup of the cream, milk, sugar, salt and basil in a small sauce pan. Heat until very warm, but not boiling. Remove from heat, cover and allow to sit for 15-20 minutes. Discard basil. Return pan to stove and heat again. While basil is steeping, prepare an ice bath. Fill a large bowl with water and ice. Place a smaller bowl inside and pour in other cup of cream. To make the custard, whisk egg yolks in a separate bowl and add about a 1/2 cup of the warm cream mixture into the eggs while continually whisking. This will help "temper" them so they don't scramble. Return egg mixture to the pan and cook, stirring constantly, until mixture is thick enough to coat the back of a spoon. Strain custard into chilled bowl with the cream and add vanilla extract. Stir until mixture has cooled down considerably. Refrigerate for at least four hours or overnight. Freeze in an ice cream maker according to manufacturer's directions. Towards the end of the process (when ice cream is 2-5 mintues from being finished), add in the peaches and continue freezing. Enjoy immediately if you prefer a "soft serve" consistency, or freeze for an additional couple hours for more traditional ice cream consistency. Garnish with additional basil and peaches and serve. It looks delicious Jaymee! Wish I could eat ice cream. I wonder if it's difficult to make Coconut Milk or Almond Milk Ice Cream at home. Looks delicious and healthy-ish kinda. Not something I will have to kill myself at the gym for an hour, though 35 mins wouldn't hurt. Thanks again Jaymee. Though I was sad to hear that you left the Bay, I am happy because I also left the bay and now get to see you on ESPN.